Ying-ying regrets that she kept her true nature hidden while raising her daughter, Lena, and instead acted so meek and quiet that Lena stopped noticing her. For many years, Ying-ying forgot the source of her silence, but suddenly remembers the central event when watching Lena go through a divorce: the Moon festival when Ying-ying was four. Ying-ying buried her stories deep in her memory as a child, to the point that she cannot connect to her daughter. Stories are necessary to building a maternal bond, but also contain a great deal of pain that Ying-ying struggles to reveal. It isn’t until Lena is also in pain that Ying-ying is able to access the memories again. On that festival day in China many years ago, Ying-ying remembers how hot it was. Despite the heat, her nanny Amah dresses her in heavy formal clothes and tiger-patterned slippers that make Ying-ying whine. Amah tells her about the Moon Lady, who grants secret wishes during the festival but shuns selfish desires. If Ying-ying is good, she’ll get the chance to meet the Moon Lady and have a wish granted. When Ying-ying loudly wishes to be out of her robes, Amah calls that a selfish desire because Ying-ying voiced it out loud. Ying-ying’s extended family boards a lavish boat on a nearby lake to celebrate the Moon festival, and Ying-ying sneaks away to watch fishermen catch seafood and the boat’s chef slaughter animals for the evening’s banquet. Before she knows it, Ying-ying is covered in eel blood and fish scales from sitting in the kitchen. Thinking she can avoid punishment by dyeing her fancy clothes entirely red, she covers herself in blood. Amah, in a panic, discovers Ying-ying soaked in blood and scolds her for misbehaving. While the rest of the family celebrates in the front of the boat, Ying-ying is left to sit alone in the back, in only her undergarments and tiger slippers. Ying-ying has a boisterous and inquisitive nature as a child, in line with her identified zodiac sign of the Tiger. Rather than sit still and be seen but not heard, as good Chinese girls are told to do, she explores her interests and gets into trouble. Hours pass, and Ying-ying hopes Amah will come retrieve her as night falls. Instead, fireworks launch off the other boats on the lake, scaring Ying-ying and causing her to fall off the back of the boat. She flails in the lake water, unable to find the surface, and tries to call out Amah’s name. Eventually, she gets caught in a fishing net, and an old couple pull her out of the water. They try to locate Ying-ying’s boat on the crowded lake, but she can’t tell which one is her family’s. The old couple end up placing her on shore, assuring her that her family will find her once they notice she’s missing. Unlike the other vignettes, where mothers play key roles, Ying-ying’s mother is virtually absent, and Amah acts as a substitute maternal figure. Yet in Ying-ying’s time of need, when she’s potentially drowning and calling out her nanny’s name, even Amah is not present. This represents Ying-ying’s constant feeling of loss and incompleteness throughout her narrative, her sense of never having been found. Rather than wait on shore, Ying-ying follows the sound of music to a stage, where a play retelling the Moon Lady myth is happening. Though too far from the stage to see details, Ying-ying is mesmerized by the Moon Lady’s beauty and the sorrow of her banishment for defying her husband, the Sun. Ying-ying relates the Moon Lady’s loss to her own loss at getting separated from her family. Hearing the Moon Lady’s sorrowful story, Ying-ying finds a maternal figure she can relate to, who articulates temptation and regret as understandable human actions rather than bad behavior. The opportunity to feel connected to someone through shared stories is key to emotional fulfillment in the novel. After the performance, Ying-ying eagerly seeks out the Moon Lady backstage, thinking the goddess will answer her wish and reunite her with her family. To her horror, Ying-ying discovers that the Moon Lady is a male actor in drag, shattering her naïve hopes. Just as young Ying-ying thinks she’s found a woman to guide her, her hopes are dashed. She is still unable to connect to any maternal source of wisdom. Ying-ying as an adult has pushed this memory away until she sees Lena suffering in a loveless marriage. At that moment, Ying-ying remembers the wish she wanted to tell the Moon Lady: she wished to be found. Ying-ying was unable to be an active mother to Lena because she never had a maternal figure to give her wisdom as a child, and thus built a wall of silence between them. However, Ying-ying does understand sadness, and is finally able to access firsthand wisdom to pass on to Lena. Ogi, Alyssa. "The Joy Luck Club Part 1, Chapter 4: The Moon Lady." LitCharts. LitCharts LLC, 24 Jul 2015. Web. 17 Apr 2019. Ogi, Alyssa. "The Joy Luck Club Part 1, Chapter 4: The Moon Lady." LitCharts LLC, July 24, 2015. 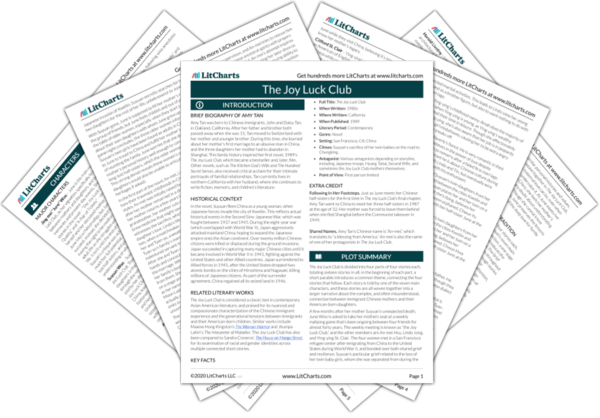 Retrieved April 17, 2019. https://www.litcharts.com/lit/the-joy-luck-club/part-1-chapter-4-the-moon-lady.